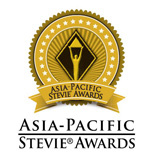 By popular demand, the final entry deadline for the 2015 (2nd annual) Asia-Pacific Stevie Awards has been extended to Wednesday, March 25. All individuals and organizations in the 22 nations of the Asia-Pacific region -- public and private, for-profit and non-profit, large and small -- may submit nominations. Gold, Silver and Bronze Stevie Award winners will be announced on April 1. The 2015 winners will be celebrated at the second annual awards banquet on May 15 in Shanghai, China. The website at http://Asia.StevieAwards.com is available in, and entries may be submitted in, seven languages: Chinese, English, Indonesian, Japanese, Korean, Malay and Thai.